Exploring with Vermicelli. 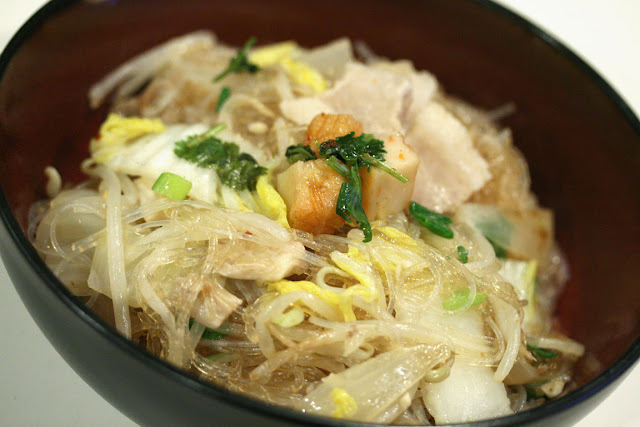 Vermicelli Noodles (粉絲) has been one of my favorites. Not a lot of places serve them as main course noodles, so I decided to give it a try to make it the way I wanted it. It turned out surprisingly good. Recipe of my invention on bottom. 1. Soak dry Vermicelli Noodles in room temperature water for 5-10 minutes while preparing and chopped ingredients. Boil water and cook Vermicelli Noodles for 2 minutes. Set aside. 2. Heat up 1-2 tablespoons of oil in large frying pan. Cook garlic and onion until onion turns color. 3. Add in pork. Cook till the pink starts changing color. Add in Napa and Bean Sprouts and cook for a while. Add in Mushroom and Fish Cake. 4. Add in Vermicelli Noodles. Add 1-3 cups of water to moisten noodles. (Chicken Broth optional) Season with Oyster Sauce, Soy Sauce, Sesame Oil, and Chili Oil. Finally, add cilantro and spring onion. Ready to serve. Sprinkle Sesame Seeds to garnish (optional).